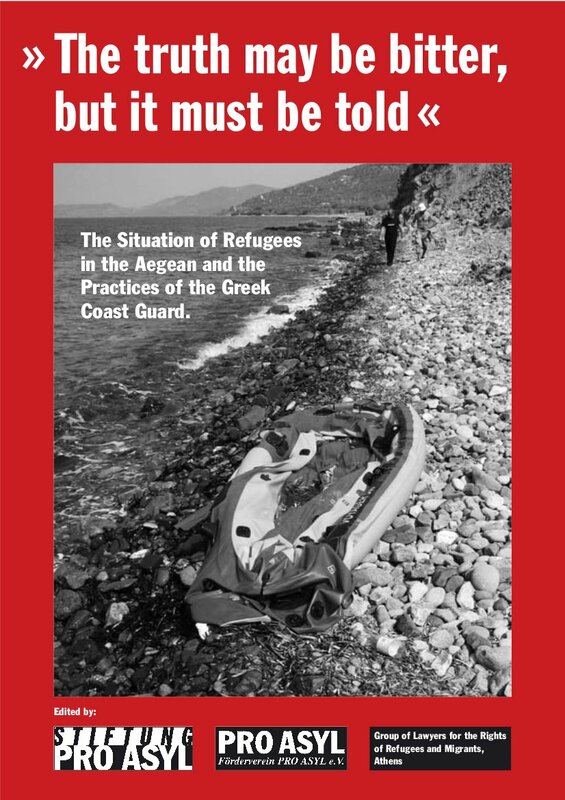 In 2007, the german human rights organisation Pro Asyl published a report about the the situation of refugees in the Aegean and the practices of the Greek coast guard. The report details the inhuman, degrading and life threatening treatment of refugees who attempt the crossing of the border. The report is also concerned with the access to the asylum system and the condition under which refugees are detained. The coast guard attempts to block small boats carrying refugees and push them out of the national territorial waters. In order to do so, they circle the boats with their own boats causing waves. These risky maneuvers can result in the death of refugees. Refugees who are already in Greek territorial waters or even at the Greek coast are being driven back into Turkish waters. Their dinghies are deliberately damaged, so that they can, at best, return to the Turkish coast. Refugees are being ›refouled‹ by the coast guards and deposited on so-called »dry (i.e. uninhabited) islands«. The Greek coast guard systematically abuses newly arriving refugees. In one reported case (on Chios island), the degree of maltreatment amounted to torture (serious beating, mock execution, electric shocks, pushing a refugee’s head into a bucket full of water (»submarino«). The administrative practice at the border deprives refugees and other persons in need of international protection of their rights and exposes them to serious risks. Detention conditions on all three islands visited constitute inhuman and degrading treatment.